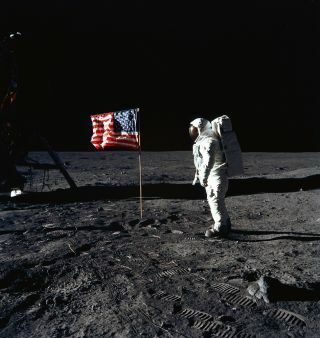 Buzz Aldrin stands on the moon during NASA’s Apollo 11 mission in July 1969. NASA, the National Aeronautics and Space Administration, is the U.S. government agency responsible for leading the nation's explorations of space. Its mission is "to reach for new heights and reveal the unknown so that what we do and learn will benefit all humankind." Since its formation in 1958, NASA has taken to the skies both on and off Earth. Today, NASA consists of 10 different centers spread around the country. But it got its start by scrapping together pieces from existing agencies. As part of the International Geophysical Year (from July 1, 1957, to Dec. 31, 1958), a cooperative effort to gather scientific data about the Earth, President Dwight Eisenhower approved a plan to put into orbit a scientific satellite. The Soviet Union quickly announced its own intentions, and then surprised the world by launching Sputnik 1, the first artificial satellite, on Oct. 4, 1957. "This had a Pearl Harbor effect on American public opinion, creating an illusion of a technological gap and provided the impetus for increased spending on aerospace endeavors," NASA's history website says. The United States wasn't far behind their Cold War rivals. After some setbacks and failed rocket launches, the first U.S. satellite, Explorer 1, reached orbit on Jan. 31, 1958. Not content to simply circle the Earth, Explorer 1 sought to study the planet and its environment. "Explorer 1 was also a science mission," Willis Jenkins, the program scientist for NASA's Explorer Program, said on the agency's website. "This wasn't just launched to get a satellite up in space, it was meant to bring science data back down." Explorer 1 contained experiments that helped to identify the Van Allen radiation belts that surround the planet. On Oct. 1, 1958, the United States consolidated its space exploration operations under a new agency, NASA, which replaced the National Advisory Committee for Aeronautics (NACA), founded in 1915 to explore aeronautical research when airplanes were just starting to take flight. Also absorbed by NASA were Langley Research Center in Virginia and Ames Research Center in California, both still operational today. NASA also incorporated other science groups, such as the Jet Propulsion Laboratoryin Pasadena, California, and the Army Ballistic Missile Agency in Huntsville, Alabama. On May 25, 1961, only 20 days after Alan Shepard had become the first American to reach space, President John F. Kennedy told the United States, "I believe that this nation should commit itself to achieving the goal, before the decade is out, of landing a man on the moon and returning him safely to Earth." With Kennedy's announcement, getting to the moon became NASA's priority. The Mercury and Gemini programs tested U.S. technology and human endurance in space. The Apollo program was designed to take the final steps toward the moon. There were challenges and setbacks, such as a fire that killed three Apollo 1 astronauts, but by 1968, the agency sent astronauts around the moon, with Apollo 8. On July 20, 1969, Neil Armstrong became the first human to set foot on the moon, famously declaring, "That's one small step for [a] man, one giant leap for mankind." The Apollo program continued until 1972, with 12 astronauts walking on the lunar surface over 6 landing missions. Although humans had finished walking on the moon — at least temporarily — NASA continued to send them into space. In 1973, NASA's Skylab program sent three human missions to stay aboard a relatively small workshop orbiting the Earth. "The Skylab program also served as a successful experiment in long-duration human spaceflight," NASA's website says. In 1975, NASA and the Soviet Union cooperated to achieve the first international human spaceflight, the Apollo-Soyuz Test Project, which successfully tested joint rendezvous and docking procedures for spacecraft from the two nations. The United States began work on what would become the International Space Station (ISS) in 1984, with Russia and other international partners joining the venture in 1993. On Nov. 2, 2000, the first humans began to inhabit the ISS. Ames Research Center, in Moffett Field, Calif., leads "research and development in aeronautics, exploration technology and science." Armstrong Flight Research Center, in Edwards, Calif., is NASA's "lead center for atmospheric flight research, operations and testing." Glenn Research Center, in Cleveland, Ohio, "designs and develops innovative technology to advance NASA's missions in aeronautics and space exploration." Goddard Space Flight Center, in Greenbelt, Md., manages operations for the Hubble Space Telescope and communications between mission control and astronauts aboard the International Space Station. Jet Propulsion Laboratory, in Pasadena, Calif., is the leading center for robotic exploration of the solar system. Its missions include the Juno spacecraft, Kepler Space Telescope and the Mars Curiosity rover. Johnson Space Center, in Houston, Texas, is the home of NASA's astronaut corps and center of mission control. NASA astronauts have long used "Houston" when addressing their handlers in Mission Control, exemplified by Jack Swigert's famous utterance during 1970's harrowing Apollo 13 moon mission: "Houston, we've had a problem." Kennedy Space Center, near Titusville, Fla., is America’s spaceport, hosting all of the federal government's manned spaceflights since the late 1960s. Langley Research Center, in Hampton, Va., has studied the challenges of flight for more than 100 years. Researchers at Langley designed the plane that broke the sound barrier, figured out how to stay in contact with astronauts in space, hunted for the best lunar landing spots and helped develop the space shuttle. Marshall Space Flight Center, in Huntsville, Ala., is where researchers design and build the engines, vehicles, space systems, instruments and science payloads for missions. Stennis Space Center, in southern Mississippi, is a test site for rocket engines, including the Saturn V rockets that sent astronauts to the moon and the new Space Launch System. Sputnik and the Creation of NASA: A Personal Perspective — Eilene Galloway, often called "the grand matriarch of space law," tells how she came to work for Lyndon B. Johnson and helped him bring NASA into existence.